Hello there! If you are new here, please subscribe to our e-mail list or subscribe to the RSS feed for updates! Whisk flour blend, baking powder, baking soda, salt and xanthan gum in a large bowl. Transfer bananas to a fine-mesh strainer and let drain over a medium size bowl. Stir occasionally and after 15 minutes you should have 1/2-3/4 cup of liquid. Transfer the banana juice to a medium saucepan and cook over medium-high heat until it’s reduced to 1/4 cup (about 5 minutes). Return the juice to a bowl, add the bananas, mash with a potato masher until mostly smooth. Whisk in melted butter, eggs, brown sugar, and vanilla. Using a rubber spatula, stir the banana mixture into the flour mixture until combined with no lumps remaining (about 1 minute). Gently fold in walnuts and scrape the batter into a prepared pan. Smooth out the batter and sprinkle with granulated sugar. Bake until a toothpick inserted into the center comes out clean. 55-75 minutes. Let bread cool in pan on wire rack for 15 minutes. 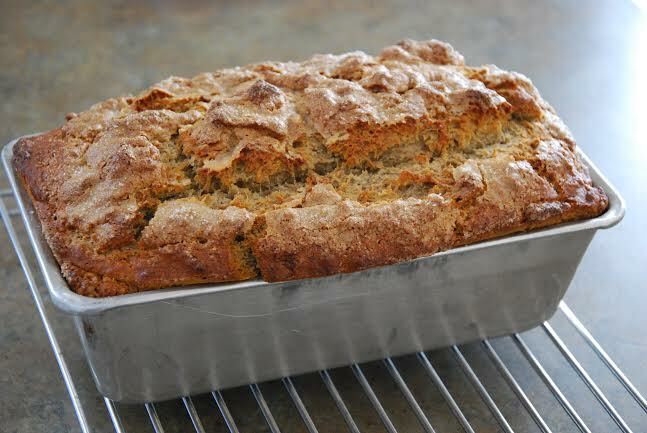 Remove bread from pan and let it cool for 1 hour before serving. It’s best to eat it the day of, but it can keep up to 2 days when stored at room temperature wrapped up in plastic wrap.